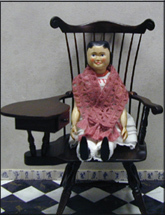 I started my life as a doll having been carved out of mountain ash wood by Mr. Fifer and dressed by his wife. My number is #31 and I am dated July 24, 2002. As you can see by my number I had many more sisters before me and I know of at least one after me. I was sent to my owner via mail and arrived at my new home on August 21, 2002. Just like the very first Hitty made in the 1820s who was owned by several different children and adults, my owner is an adult lady named Esther Robertson. She first heard about a Hitty doll in April of 2002 when she went with her friend to pick out one from Mr. Fifer. Her next encounter was the first week-end in August when she read the book about Hitty written by Rachel Field in 1929. The book is "Hitty, The First Hundred Years" and won the Newbery Award in 1930. At that point she needed me! The first thing that happened as I came out of the shipping box was to have my picture taken so that Mr. Fifer could be notified that I had arrived safely. Since I traveled only in my undergarments, my dress will follow later, Esther wrapped a beautiful rose colored crocheted shawl that she had had for about fifteen years around me and sat me in chair that was a bit too big for me. She said it was 2" scale and made by a man named Mr. Wallack. Esther has been involved in miniatures for about twenty-five years and was not using these items. This was to be only a temporary situation until she had time to make and acquire the things I would need. The man of the house, Russell, came home shortly. He had heard nothing except talk of Hitty for over a week and was pleased and relieved that I had finally arrived and Esther had a doll of her very own. He had liked hearing some of the adventures of the first Hitty and suggested she order a number of books so she could share the story with other folks and also put one in their church library. I thought that it was a great idea. A couple of hours later her friend Harriett arrived. She was anxious to see me and I was so relieved that she liked me also. Her favorite dolls are the fancy dressed ladies of the Victorian era but she said that I was growing on her. Esther had already collected some fabric samples for some of my needs so the two of them tried to decided on which ones to use for various items. Harriett will read the book about me when the order comes. The store can not keep them in stock. The rest of the week I spent my time at the workbench watching Esther work on her miniature project. It is a Vermeer studio. She said she was glad to have company. On Saturday afternoon Carol, Martha and Barbie arrived. Carol is the Robertson's daughter. Martha is like a second daughter and Barbie is Martha's niece. They had been on a week's vacation and Carol's dog Phyllis had been staying here. I was placed on the sideboard in the living room so they could see me immediately when they came into the house. They had heard all about me the week before when they were here to leave the dog and were expecting to see me. Carol and Martha are very much the outdoor types and not into dolls, needlework etc, however, Barbie is into both. She likes to make quilts and do cross stitch and even has an American Girl doll. She liked looking at the clothes that Esther's friend Barbara had sent for her to get ideas as how to make my things. She certainly took a lot of measurements! I don't know what she has in mind but it is possible she may want to get a Hitty doll also. Wouldn't that be nice!